I recently came across eCom Profit Sniper, an e-marketing business opportunity that claims can change your life by allowing you to make thousands of dollars online every single day from the comfort of your home. The sales video consist of black hat marketing elements as per the sequence below. Not only do these low quality products can't deliver any results claimed inside each sales video, majority also come with expensive upsells inside member's dashboard. People who are complete newbies can easily fell prey and be coaxed into buying more later to find out that making money online is never as easy as claimed inside these sales videos. To give this product benefit of doubts, I decided to find out what is eCom Profit Sniper and show you how the inside of members area looks like. What is Inside eCom Profit Sniper? Is eCom Profit Sniper Another Hyped-Up ClickBank product? What I Like About eCom Profit Sniper? 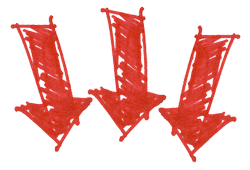 What I Don't Like About eCom Profit Sniper? Summary: eCom Profit Sniper is a hyped-up, low quality training program that teaches you basic stuff on how to start a dropshipping business using Shopify. 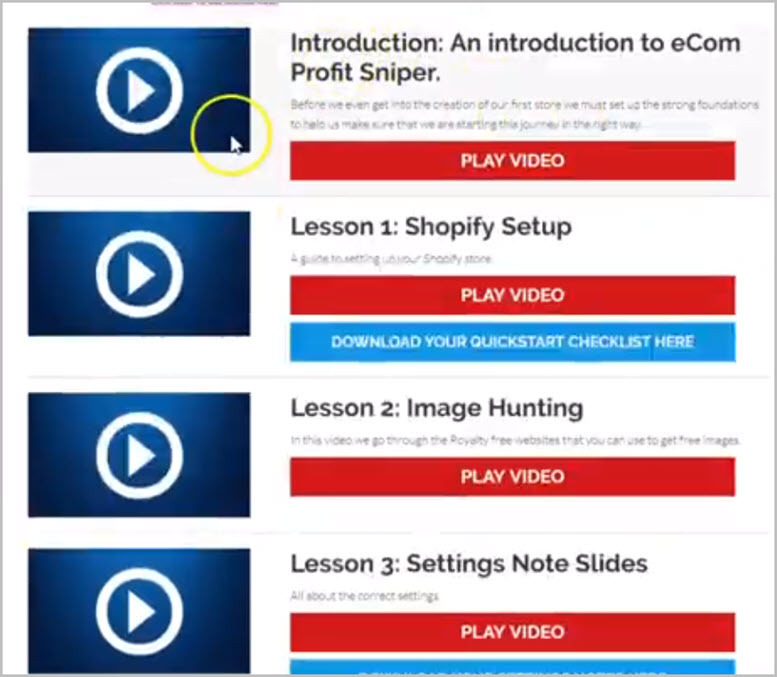 Basic Training inside eCom Profit Sniper can't help you make money within days as claimed in the sales video. I suggest you get my FREE T-Shirt Cash Formula, at least you can learn proven method to start a business selling T-shirt. eCom Profit Sniper is a program that teaches you how to start a dropshipping business using Shopify, which is a very popular ecommerce platform that has everything you need to sell online, on social media or in person with point of sale. There's no secret at all as claimed inside the sales video. Shopify is so popular that if you search “how to start an ecommerce store”, Shopify will definitely shown on the first page of Google. Before I go further, let me explain to you the concept of dropshipping. According to Shopify, dropshipping is a retail fulfillment method where a store doesn't keep the products it sells in stock. Instead, when a store sells a product, it purchases the item from a third party and has it shipped directly to the customer. As a result the merchant never sees of handles the product. Few platforms you can find dropshipper are AliExpress, SaleHoo and Doba. This means, your job is just to promote product without the need to handle storage, delivery and return. Here are different ways to drive traffic to your ecommerce store. Below is a video showing you how dropshipping works. Training inside eCom Profit Sniper is so basic and what it did was just to skim the surface of what it really takes to make money. The truth is eCom Profit Sniper provides only some very basic training on how to setup Shopify store and how to setup Facebook page. But you can easily find all these training for free if you follow Shopify blog that provide tips on how to sell on this popular ecommerce platform. Let me share with you what's inside eCom Profit Sniper and the type of training you will get. Once you are inside member's area, you will be asked to setup your Shopify account by following through steps shown on the introduction video. What eCom Profit Sniper did was just to show you how to setup a 5-Star Shopify store without teaching you how to get traffic to your ecommerce store, convert traffic into sales or how to select reputable dropshipper. Despite there's a Facebook tab inside member's area, it only shows you how to setup Facebook page. There's no training about buying Facebook ads such as setting custom audience, tracking pixel and retargeting ads. The templates inside eCom Profit Sniper can be found anywhere from the web. Again, all these basic training and templates you can get for free inside Shopify blog. Obviously! eCom Proift Sniper is extremely hyped-up product sold on ClickBank. It's just another program used by some black hat marketer to coax naive people into buying “a fake hope”. Trust me, you will not start making money in minutes or hours as claimed inside the sales video. That's impossible! Shopify is Legit: The good news is making money by selling on Shopify is legit. However, you don't have to buy eCom Profit Sniper to start with this awesome ecommerce platform. Just head over to Shopify Blog and you'll learn everything about making profit with this platform. All the training that you need is in there. 60 Days Money Back Guarantee: As this is also another ClickBank product, therefore you are 100% guarantee of a full refund if you decided to get a refund. I've tried to request for refund from Clickbank. Despite the vendor might try to offer you some free upgrades in order to change your mind, but most of the upgrades are also low quality. It's a complete waste of time. Misleading & Half-Truth Information: To identify whether any program is using black hat strategy, I look for information that is questionable and start putting on my black hat to analyze. 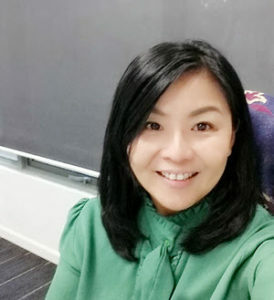 First, eCom Profit Sniper is showing the so-called “income statement” that indicates someone is making $2,308.24 in one day, $44,290.11 in one month and finally a staggering income of of $521,704.33 in one year. But those figure is not really profit earned. It's actually sales from dropshipping which means you haven't deduct the product cost. eCom Profit Sniper didn't tell you upfront about the hidden cost such as advertisement, engage a team and the need to subscribe for Shopify or other business tools. Second, it's telling you that to earn this kind of money, you don't need to spend hundred of hours to master the skill. Hilarious… do you really believe this? This is not possible at all. Regardless you are making money with affiliate marketing, dropshipping, webinar or ecommerce, it's going to take you time … and it's a lot of time! Third, it even claims that this strategy is never known by “anyone”. Look, I've explained that eCom Profit Sniper is only a program that teaches people how to sell on Shopify. If you are reading this now, and heard of Shopify before, then the information is definitely twisted to keep you feeling curious. But if you too never heard of Shopify, I suggest you ask whether your friends know about. BEWARE: I am sorry if you stay in a developing country as most people in these countries might be gullible to believe that all these are real. Unknown Owner: I've said this many times and I want to repeat this again. No scammer is going to spell out in front of your face that they are the scammer. That's the reason why you won't find out who's the real owner of eCom Profit Sniper. Fake Testimonials: First testimonial from a woman claims to make $40k every single month after joining for 3 months, second fake testimonial from a man claims to make $10,000 in just within days and the third fake testimonial from a woman claims to make $523,809.44. You can find all these spokesperson offering their services on Fiverr.com. It is only less than $30 to engage them for a short video. With such low price to buy eCom Profit Sniper, to say that this program is a scam is really my personal opinion. Who knows there might be people who do not mind to pay $37 in order to save them trouble from the need to research for basic information online. Whether eCom Profit Sniper is a scam or not, the truth is, this program is extremely misleading and hyped-up with the intention to deceive. That's enough for anyone to stay far away from eCom Profit Sniper. I strongly do not recommend anyone to buy this program. How I Build My Online Business? It's never easy as what was claimed inside eCom Profit Sniper to build a long-term profitable online business. All these were not taught inside eCom Profit Sniper. I would say eCom Profit Sniper is just a super low quality dropshipping program that shows nothing but merely how to setup a store. 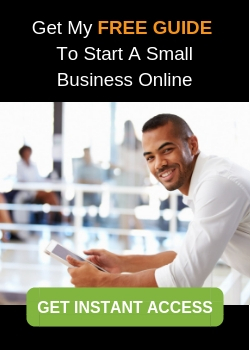 If you really want to learn how to start a small business online so you could make money by working at home, then I suggest you to sign up for a FREE Starter account with the program that have helped me make money online. It's absolutely free and no credit card involved. The best is you can keep the free membership for lifetime! I hope you enjoy reading this post about What is eCom Profit Sniper. If you find this post valuable, please share on your Facebook and Twitter too. 4 Comments on "What Is eCom Profit Sniper: Only 20 Minutes Work A Day?" I must admit I never heard about eCom Profit Sniper until reading your blog. How did you find it? I decided to do a quick search to see what I found and basically everything aligns with what you outlined. What’s shocking to me is how they are selling the idea of making such a huge amount of money without proper training!I’m glad you were able to shed some light on this and help people who may be tempted to buy into this get rich scheme. I was trying to check out the best way to do dropshipping and thats’ how I came to know about eCom Profit Sniper. In fact, previously I also try out similar product called AZ Code. But none can really help anyone make money without getting the right training. On top of that, you still need to pay for hefty advertisement fee if you want to make this works. All these critical information is never revealed in its sales video. Luckily there’s refund policy by ClickBank, otherwise, many will lose money investment in these low quality products. Great review. I was looking at eCom Profit Sniper. I will tell you, I got a bit excited and overhyped that this could be an easy solution to making money online. I tell you, it’s easy to get caught up with a solution like that. Even though I know a lot about affiliate marketing, I still find myself reading a review and getting excited, but super stoked you wrote the truth about it. You saved me some cash. Hi JB, great to know that you find my eCom Profit Sniper valuable. There’re just too many low quality program sold on ClickBank. No doubt there are some value in each program, but wasting even a dollar knowingly that these investment can’t deliver as promised is really not necessary. Many times, I don’t have to buy the product to know it is low quality. There are just some similar traits you can find in these low quality products. Most marketers will use black hat marketing to get sales. Anything that promises quick money with little work involved are mostly scam. However, people just want to see the truth even though they knew the program they wanted to buy might turn out to be a scam. That’s why I create product reviews to SHOW them the truth. I’ll write more product reviews so my readers can make informed decision and prevent from getting scammed.